The dictionary tells us that a zealot is one ‘who is fanatical and uncompromising in pursuit of their religious, political, or other ideals.’ Here is not the place to discuss the two unmentionables ‘politics and religion’ but other ideals maybe. In my ideal world people would engage with and preserve the heritage that surrounds them. They would value their ancestry and be interested in passing on the stories of preceding generations. Most people who undertake historical research as a hobby would agree that it very swiftly become much more than a hobby and yes, we may well own up to the ‘fanatical and uncompromising’ label. Anyone who has stuck with me from A all the way to Z during April can probably tell that, for me, history in all its forms is an obsession. Yes, it has taken over my life – although I enjoy making room for my other interests, not least of which are my wonderful family, my home and garden and the great outdoors – both near and far. Back to the dictionary and we learn that a fanatic is ‘a person filled with excessive and single-minded zeal’. Like any ‘fanatic’ I am single-minded about my history and I do want to share it with anyone who will listen. This doesn’t mean I want to bore people rigid with stories of my research – I want to encourage others to take an active part in history for themselves. I like to think that my ‘audiences’, when I share aspects of the seventeenth century as Mistress Agnes, are entertained as well as informed. Just because I try (sometimes!) to make history amusing does not mean that it is not good history. I aim to get others to participate in history in an active way – then history does the job for itself – they are hooked! I hope that some of these A-Z posts have been thought provoking. It has been hard work but fun. Normal blogging service will now resume, with less frequent posts and random musings about my historical and occasionally hysterical life. Unusually, I was interested in family history before my seventh birthday and was seriously researching in my early twenties. At a recent local history talk that I gave, my most enthusiastic audience member was an eight year old boy – brilliant. If we believe that it is vital to enthuse younger generations with our love of history and family history, rather than just hope that, with all the other competing interests, they will enthuse themselves, what can we do? Having worked with young people, both in and out of a history and family history context, I believe that the spark is there now, young people ARE interested. I could spend the rest of this post trying to prove this to you but I believe there are more important things to be said. I promise they are interested or they could easily be persuaded to be interested, if approached in the right way. In that case, why are most local and family history groups made up of wonderful people who are nevertheless, predominantly of retirement age? Here is the crux of the matter – young people are not interested in doing things OUR WAY. Be aware, be very aware, that young people have the attention spans of gnats and they expect things to be immediate, bite-sized, visual and interactive. That’s fine you might say, I can do modern technology, I have a website. Websites are great but not if they are effectively a 1970s textbook on line. Young people want a young people’s website. Look at Devon Family History Society’s Acorn Club website pages. They are designed for young people and most are not Devon specific. One of the best ideas for involving young people came from a family history student of mine who wrote a series of illustrated letters to his ten year old grandson, as if from his grandfather (the boy’s great great grandfather). These involved a certain amount of Victorian local and social history research but worked wonderfully. If your descendants aren’t likely to read letters there are always emails, blogs or text messages! Have a look at the television series ‘Horrible Histories’ – now presented by Stephen Fry and featuring such delights as ‘we sell any monk dot com’ and ‘The V factor’ (auditions for a Viking rock band). Yes, personally I preferred the books that spawned this TV series and the excellent, interactive website that goes with it and I do have to confess to being irritated with the leaping from Aztecs to the first world war and back to the Tudors (young people have enough trouble with chronology as it is) but here I am not following my own advice. I am a book person, young people, sadly, often are not. I must not want them to do it my way. Start with the TV programmes and the website, maybe that will lead on to the books. I’ve yet to find a 7-13 year old who doesn’t like this series. For young people who will sit still for more than a millisecond, you could create a photograph album together. Most family tree software will allow drop-line pedigrees with photos which could also help. I know many of you do try to involve young people but for those who feel that it isn’t possible to interest the younger generation, that just isn’t so, it just has to be done THEIR way. Get them young. Give me a child until they are seven and I will give you the person who will want to inherit your historical research. Over to you. If you want to hear more on this theme, book me for my ‘Harnessing the Facebook Generation’ talk or I can advise on running a young persons’ day for local and family history groups. Several books have been written to encourage younger family historians. Particularly recommended are Anthony Adolph’s Who am I? 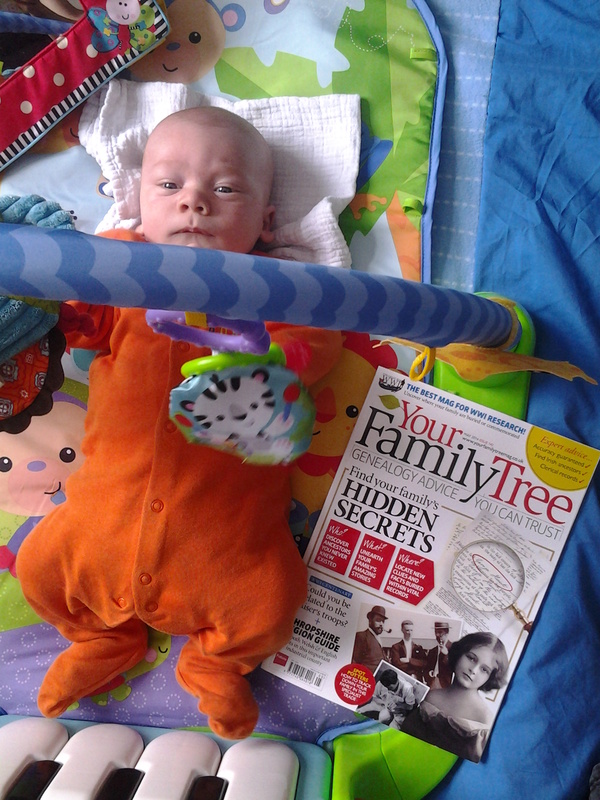 The Family Tree Explorer (Quercus 2009). 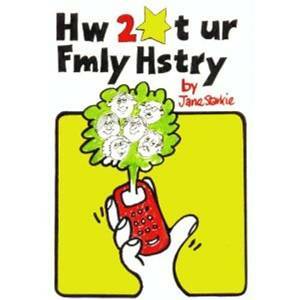 Emma Jolly’s Family History for Kids (Pymer Quantrill Publishing Ltd. 2007) and Jane Starkie’s Hw 2 *t Ur Fmly Hstry (FHP 2008). There are a number of “fill in the gaps” family history books for younger children. Zap the Grandma Gap by Janet Hovorka (Family ChartMasters 2013), with its accompanying workbook and website is full of ways in which adults can help to inspire the younger generation with a love of family history. How often do we think about levels of literacy in the past? And what indeed is ‘literate’? Before compulsory schooling, which incidentally arrived on the Isles of Scilly some 50 year before the rest of England (don’t say you don’t learn anything useful reading my ramblings), there was far greater emphasis on the ability to read. Writing was dangerous. Give the hoi polloi the ability to write and they may write something subversive. You are giving them the power to spread sedition. Reading on the other hand enables them to read the Bible and thus improve themselves. There have been many academic studies on literacy levels at different points in time. Often these are based on the ability to sign one’s name in a marriage register. There is of course a very large gap between making an approximation of one’s name and fully functioning literacy but it is difficult to find a better measure. There are instances of those who are perfectly capable of writing signing with an X instead – who knows why? We could use other lists of signatures, such as tax lists as an indicator of literacy levels. Some records specifically mention whether or not an individual can read or write. For example, I have seen this on some lists of prisoners and emigrants. Just because the measures of literacy are crude, it does not mean that it is not worthy of examination. For local historians it can be fascinating to study how literacy levels appear to change over the decades. If you are interested in a rural area, how does this compare to a town, or to another village in a different part of the country? Family historians too may like to consider how recently different branches of the family were able to read and write. What about book ownership in your family? Do you come from a long line of bibliophiles? 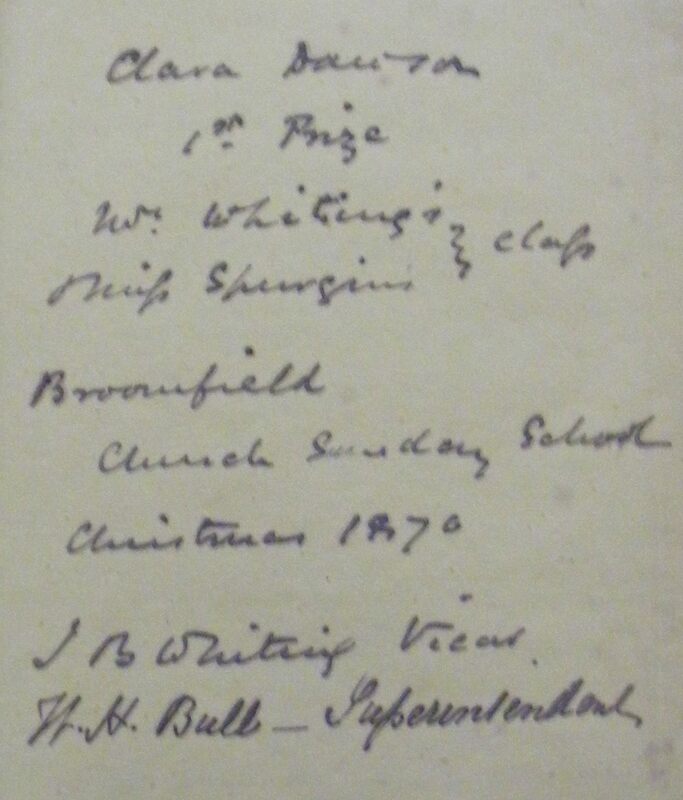 Do you still have any books owned by your ancestors? These are often useful if they are inscribed as prizes or gifts. Books gained in this way may not however be representative of their literary taste! Have you made a list of books you enjoy? Have your favourites changed over the years? This is part of the life story that you starting writing yesterday having read my ‘W is for Writing it up’ blog (you did start didn’t you?). A final thought on ‘X’ as a signature substitute – have you considered why people’s marks may be other than an ‘X’? I have an ancestor called William whose ‘mark’ was an ‘M’. This makes perfect sense when you think of situations in which this individual may have seen his name written down. He would be the opposite side of a desk from an ‘official’ writing ‘William’, The first character William therefore saw, from his side of the desk, looked like an ‘M’. We all plan to do it don’t we – write our memories, write that local history book, write up our family history. It is all so easy to put it off, ‘I will do it when I retire’, ‘I will just finish the research first’. Well, don’t be deluded, you will never ‘finish’ and as for more time in retirement – any retiree will tell you it just doesn’t work that way. Writing up your research into a coherent narrative helps it to become appealing to your nearest and dearest. You know, those close to you who adopt a glazed visage when you enthuse about great great grandad’s first cousin once removed. Writing up aspects of local history enables you to share with others who are also interested. You may know it is a ‘good thing’ but the mechanics worry you. ‘I was never any good at writing’, ‘I don’t know where to start’. There is help out there. Take a creative writing course, or better still a writing up your history course – I run face to face courses for local and family historians and others do the same in different regions. There are also similar online courses available. There are books on how to write family and local history (see below). There are groups that can help and encourage you. Read what others have done to get ideas of what you do and do not, want to emulate. Use the spelling and grammar checkers on your computer, use the Thesaurus. You are not writing a three volume novel – start small. Begin with the history of your house, not the whole town. Write about granddad’s war experiences, not the history of the whole family since Tudor times. Don’t just think in terms of writing a ‘book’. You could create a blog, a short article, a video, a presentation or an exhibition instead. Give yourself a deadline, maybe an anniversary that needs to be celebrated. Do it, not next year not next month but NOW. Make a start – you don’t even have to start at the beginning. Once you put fingers to keyboard you will be surprised how easy it is. Can you recall the voices of your immediate ancestors? Do you know what the dialect sounded like in your local area? I touched on this in ‘Q is for quotes’ but this is more about the sound, rather than the actual words used. Many of us have recording done in the mid-twentieth century. These may be on cine-films, reel to reel tapes or cassette. There are gadgets that you can buy to convert cassette recordings to computer files and there are companies that will translate obsolete formats to disc. This can be expensive but is worth doing. If you are interested in the history of a locality, capture regional accents before they are eroded. Seek out old recordings from film archives and those in private hands but also record the accents of today – and given modern levels of migration and immigration, there may be a great many in your area. 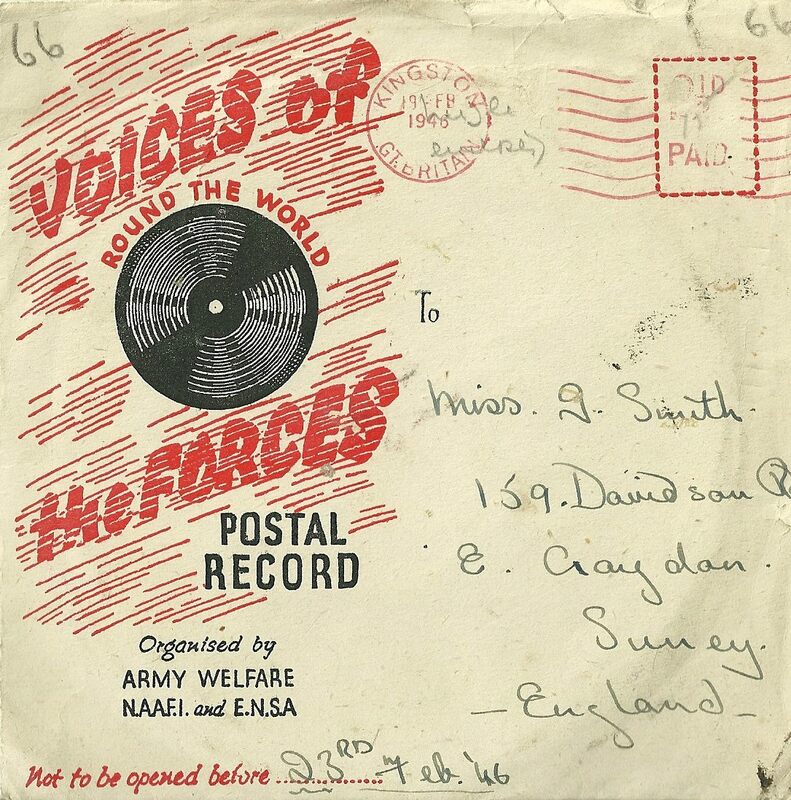 When my mother died I found a ‘Forces War Record’, recorded for her by my father in 1946. As my father died when I was nine I had no real recollection of how he sounded. I was able to get this recording put on to disc, just before it deteriorated beyond saving. He was sending my mother birthday greetings. He had got the date wrong but they hadn’t know each other long at this point! His Battersea roots are not noticeable in his accent, which was distinctly BBC – probably a legacy of his career as a cinema projectionist – all those clipped tones of the film stars of the 1930s! If you have recordings please try to preserve these while it is still possible – you will not regret it. Ok I know we are getting to the tricky letters of the alphabet but you are probably thinking, what on earth can she being going to drivel on about now. You know those occasions when you have to provide your current occupation? It is usually when you are applying for some kind of insurance. Frequently there is a pre-prepared drop down list with no option for ‘other’. No chance that this list will include ‘historical interpreter’. Often ‘historian’ doesn’t appear either, although strangely most of these lists include ‘art historian’. I told you we were in danger of extinction (see yesterday’s post). Depending on my mood (and what I think will get me the lowest premium) I might go for ‘lecturer’, or ‘researcher’, or ‘author’, or even ‘museum guide’ – none of which describe all of what I do. If I say I am an ‘historian’ it conjures up visions of a, usually male, antiquarian, beavering away in a dusty study, communicating with no one. This so isn’t what I do. Err, you are meant to be writing about unity remember. – I know I am getting there. There are two aspects to this – how can a united front help the cause of the historian and how can a study of history promote unity in a community or group. Access to a world-wide audience can give historical research a completely different complexion. Group projects can be undertaken by those who never physically meet. Take, for example, my 1946-1969 project. Nearly 100 women from three continents are contributing to this study, giving me data that would be very difficult to collect If I had to meet with these ladies face to face. The scope for collaborative research is infinite. Databases can be added to by those working in distant locations; group participation makes for more detailed and comprehensive research. Local historians can accomplish far more as a group than one person can alone. This is not just an issue of time. Each person will bring their own specialist interests to the team and can enjoy working on the aspect of community history that they enjoy best. Someone who has a fascination for ancient earthworks may not be the right person to conduct oral history interviews. Team work brings greater and more focussed results. The Society for One-Place Studies is undertaking a joint project about the First World War. This is a brilliant idea because members can share ideas and experiences, can encourage each other and will eventually be able to compare results. This will make the research much more meaningful than isolated projects. Members will be able to see just how typical their communities were. Family history is like a jigsaw puzzle. If you work with others you may find some of your missing pieces. Sometimes we are all too keen to hang on to ‘our’ research (See O is for ownership) but sharing really does have its benefits. Unity of course is power. Many strange things are happening to heritage, to archives, to online genealogical data providers at the moment. If you want to campaign for the retention of an archive facility or changes to an online data provider’s system, then there may not be safety but there is certainly impact in numbers. Joining together in an organised way is far more likely to bring about change than a lone voice in the wilderness. Finally, a study of history can bring about unity and I have touched on this in previous posts. Creating a community archive can bring a community together, as they explore their shared heritage. Family history spawns renewed contact with distant family members, it may lead to family reunions, it may help to unite the family. All in all then uniting in groups of like minded people can be beneficial to historical research and engaging in that research can bring a disparate individual together with a sense of common purpose. T is for Teachers – can they inspire the next generation of historians? What do you remember about the history of your schooldays? History didn’t make much of an impression on me in primary school, where we started at the stone age when we were seven and worked our way through to the Victorians by the time we left – after all the twentieth century was hardly history was it? This did at least give us the sense of chronology that is now sadly missing from school history teaching. For me the history bug began to bite in the early years of secondary school where an inspirational teacher, Mrs Goodridge, allowed us to do things. Amongst other things, we made a model Viking Village and drew huge plans of the interior of a Tudor ship. Doing things works, it is memorable and it engages the audience. My own former pupils built historically and mathematically correct replicas of the Globe Theatre and made miniature cob cottages (well, minus the cow dung – health and safety rules). The young people I work with rarely forget having their constipation cured by the barber surgeon. I will say more about young people and history when we get to ‘Y’ because it is not just the young we need to inspire. Television programmes – from costume dramas to Who Do You Think You Are? – help to give people a sense of the past, albeit not always a very accurate one. Series such as Victorian/Edwardian/Tudor Monastery Farm go one better and are rooted in quality historical research. The interest that these programmes inspire should be cultivated. Adults and children alike need to be encouraged to engage with their heritage and what better way to do this than by making history relevant and personal. People are far more likely respond positively to the history of their own town or family than they are to the politics or economics of a far flung country in years gone by. History is being squeezed from the school curriculum in favour of ‘more relevant’ subjects. History makes us who we are, it makes our nations what they are too, for better or worse. What could be more relevant than that? Historians of all persuasions need to take up the cudgels for their subject and see that it does not itself become history. Those of us who attempt to impart our love of the subject, must be innovative in order to capture our audience, in a market that is becoming increasingly competitive. We need to meet our learners where they are, be that in a classroom, through the pages of a book or using social media. It is a challenge but needs to be done, history is too precious not to share and too much fun to ignore.